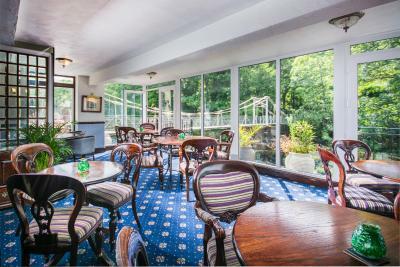 Lock in a great price for Chainbridge Hotel – rated 8.5 by recent guests! The staff could not have been nicer and the position of the hotel could not have been lovelier. The food was good and varied. We have yet more happy memories of Llangollen. The staff were very helpful. Loved the setting of the hotel next to the river, the decor and lovely flowering plants. 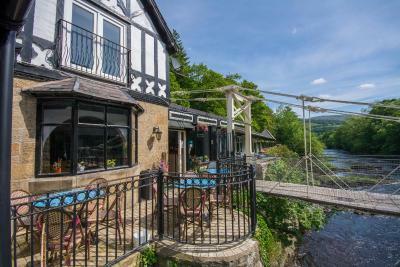 This was our 5th stay at the Chainbridge - we love the stunning and unique position of the hotel, deep in the natural forest, right above the racing river Dee, and next to the tranquil top end of the Llangollen Canal. The place is further enhanced now that the original Chainbridge over the river has been rebuilt, so you can walk both sides of the river. The Llangollen steam railway stops immediately opposite the hotel as an added bonus! Because our room wasn't ready when we arrived at 5.00 pm, and the domestic staff had all gone home and there were no other rooms available, on this occasion we were upgraded to the Chainbridge Suite - this was amazing. 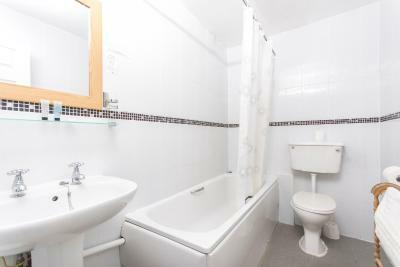 Superb facilities, comfort and space. Thank you, Chainbridge! Interesting location between river and canal. We had a fantastic little room over looking the river. Beautiful view very relaxing. Lovely atmosphere in the rest of the hotel. Thanks ladies on reception you were very helpful. We had a fantastic week and travelling with our 2 dogs can at times be an issue,but this was at no point a problem. The hotel and presentation was fantastic food was eqstuite we didnt need to travel and where else for an evening meal. We were celebrating 30 years of marridge and it couldnt of been any more special a big thankyou too all the staff that work there they made are stay far more than we ever expected and hope to rebook for next year. Amazing location . Wonderful setting. Loved having a balcony to use. The most magnificent situation , between a canal and a river , with the local old fashioned trains passing by too. Lovely hotel , very picturesque. 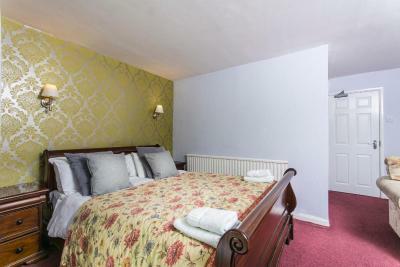 Fabulous location, friendly and helpful staff, good food; nothing remotely negative for us. 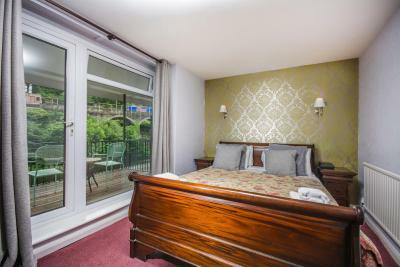 The one thing people need to be aware of is that the rooms overlooking the falls can be noisy. It didn’t bother us at all, but a light sleeper might prefer a quieter back room. The location was simply the best and the restaurant had a lovely view. 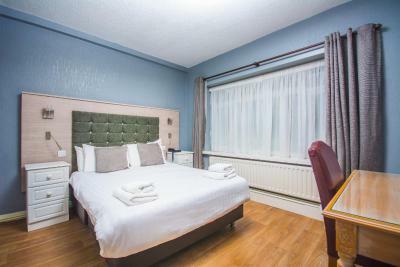 Chainbridge Hotel This rating is a reflection of how the property compares to the industry standard when it comes to price, facilities and services available. It's based on a self-evaluation by the property. Use this rating to help choose your stay! 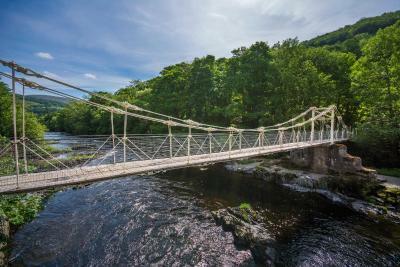 The Chainbridge is sited in a unique spot between the spectacular Dee River, with it's racing white water and leaping salmon, and the Llangollen canal. 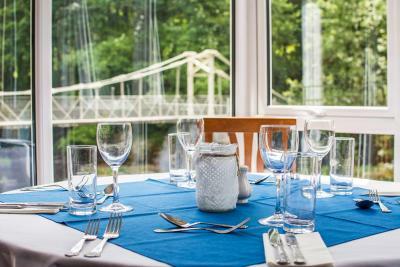 The Chainbridge Hotel, is in one of the most picturesque places in Wales, in a valley of serene and natural beauty shielded by the Berwyn and Eglwysig mountains. 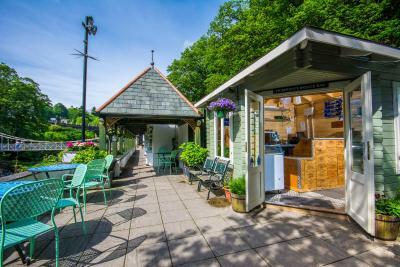 Situated on the banks of the Dee River, about a 3 minute walk away are the Horseshoe Falls, the source of the famous Thomas Telford Shropshire Union Canal, which also runs alongside the Hotel. Across the river, steam trains pass every hour. 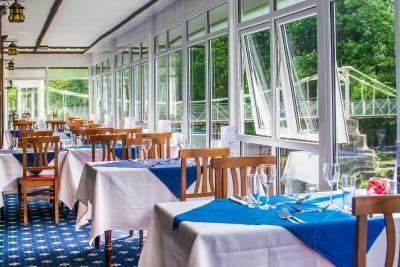 The Restaurant offers romantic and magnificent panoramic views of the river. The Tudor Bar is situated in the original building and has black and white beams, with its Inglenook fireplace where you can also sit and watch the fishermen fish the river. 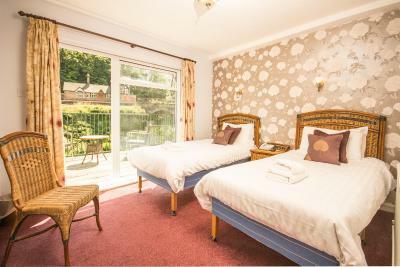 When would you like to stay at Chainbridge Hotel? 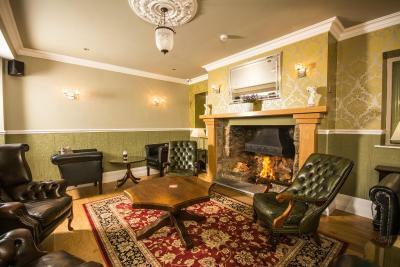 House Rules Chainbridge Hotel takes special requests – add in the next step! Chainbridge Hotel accepts these cards and reserves the right to temporarily hold an amount prior to arrival. Should you want an early/late check-in/check-out, please contact the hotel immediately after making your reservation. Please note that this is subject to availability and carries an additional fee. There was no signal on mobile phone, television service was very poor only BBC and it stations,floorboards freaked throughout hotel. Shower needs improving,no extracter fan working in bathroom and light under tv had no bulb in it, difficult to see tea making facilities. Food was very good and bed very comfortable, scenery was exceptional. Cannot think of a single thing. No wi fi or hairdryer in bedroom. Nothing to add in this section - we loved everything about this hotel and would certainly use it again if we were in the area. 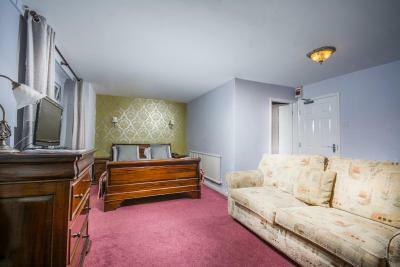 The bedroom was small a little tatty but the worst was the bed. Hard and uncomfortable had to get out of bed several times to cope. The LED bed side lights did not work as did one of the overheads. Very dim and impossible to read by. The 'dressing table' was merely a surround of a 70's mirror and was OK as a dressing table but there was no other storage spaces. Only one plug which is useless to cover modern electronic life(phone, camera, computer, tablet, hair straightners) No room for the suitcase. Bathroom OK nice bath average shower. Restaurant staff need more training as didnt know if they had any certain lagers and never came back to say so. Inept. Prawn cocktail was so bad it was untrue. The prawns tasted like cardboard and were either very old or very cheap. Asked for no dressing on the salad which arrived with. The meat however was first class and enjoyable. Despite complaining about the prawns to 2 serving staff no comments or actions made. This was repeated at reception where complaints were ignored. 4 tv channels! WiFi only downstairs! The river outside, the decor and size of rooms. Staff all helpful and friendly.